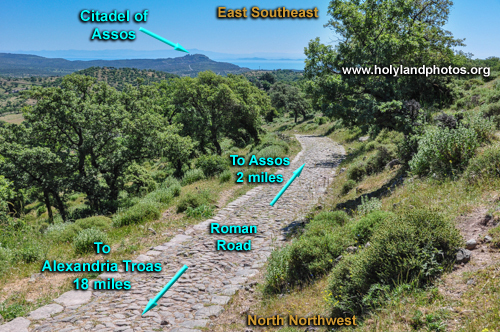 View of the ancient road that leads to Assos from the west and the north. In the upper left portion of the image the citadel of Assos is visible. Note the paving stones and well-preserved curbs on both sides of the road. After a stay at Alexandria Troas, while Paul's party took a ship from Troas to Assos, Paul, for some unknown reason, walked by foot to Assos (Acts 20:14, 15). Alexandria Troas is about 20 mi. to the north-northwest and Paul may have approached Assos via this road. Compare remnants of the Roman Road called the Via Egnatia near Philippi.